The guard conductivity channel of the probe HLG-382 is designed for focused conductivity measurement in uncased boreholes filled with conductive fluid. 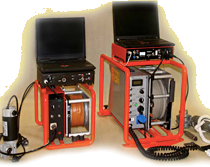 The probe is capable of providing data under conditions where conventional logs show poor results - high borehole fluid salinity and high formations resistivity. Thank to good vertical and depth resolution the probe is predetermined to indicate fractures, permeable zones, provide data on formation water quality and enable strata correlation between boreholes. The resonse of the HLG-382 probe is practically instantenous (< 0.5 sec). Natural gamma channel finds wider use, as it gives data in drillholes of any conditions (dry, cased, etc). It is an excellent indicator of lithology and it has a sharp thin-bed response. 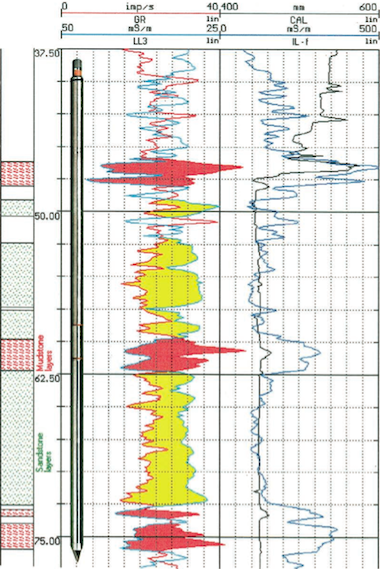 The gamma channel can be specifically calibrated in terms of ore grade uranium content. It is possible to implement fluid resistivity and temperature channels to form the probe of similar dimensions designated HLGRT-382. Resistivity and temperature is measured when the probe goes down, conductivity and natural gamma while the probe moves up.